Marking the northern boundary of the United States is a line. Its placement is almost arbitrary, the result of colonial wars and the pronouncements of kings. Yet, to cross this line is incredibly significant: on one side, one is at home, and pride in that home is called patriotism; on the other side of the line, one is an expatriate. Crossing into Canada has always been a simple act done for tourism, for travel, for life and love and work. It has also been a terribly complicated act, when avoiding the draft to war or protesting the acts of government. There have been times in the history of the U.S. when crossing into Canada has been the most patriotic act one could undertake. 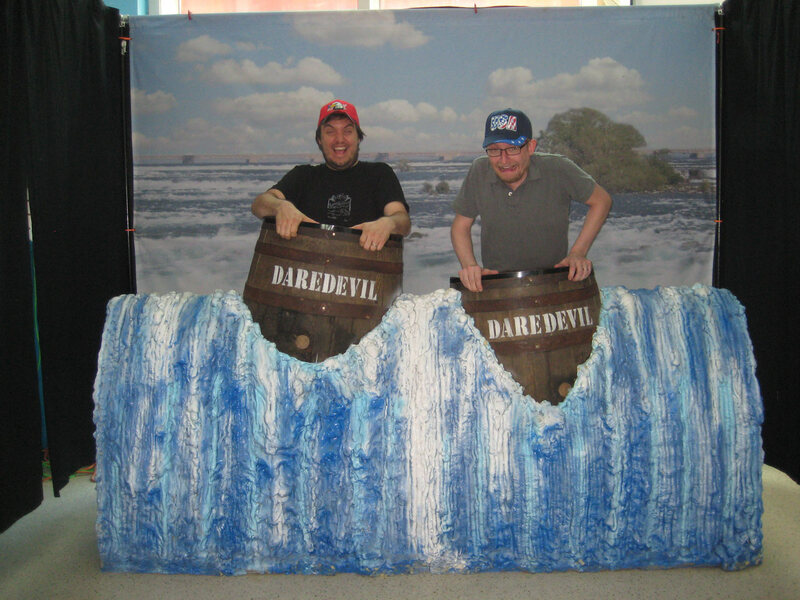 On Monday, June 11, 2012, Harvey Loves Harvey stood at this boundary at Niagara Falls and took on the role of patriot and expatriate for one day. For the performance, Harvey Loves Harvey met in Niagara Falls. On hand were two sealed envelopes, which they chose at random and opened. In one envelope was a letter congratulating the recipient on being a patriot, and allowing them to remain in the U.S. The other letter informed the recipient that they were no longer welcome in the U.S. and asked them to leave. Dean received the patriot letter, Nash was banished to Canada. With their patriotism defined, each Harvey bought clothing of their country, and began walking the streets near the Rainbow Bridge, marking their patriotism on the streets. Along the way they took pictures of their journey. 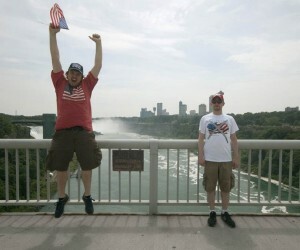 At the conclusion of their walks, they met in the center of the Rainbow Bridge at the border between the U.S. and Canada for a reunion photo. 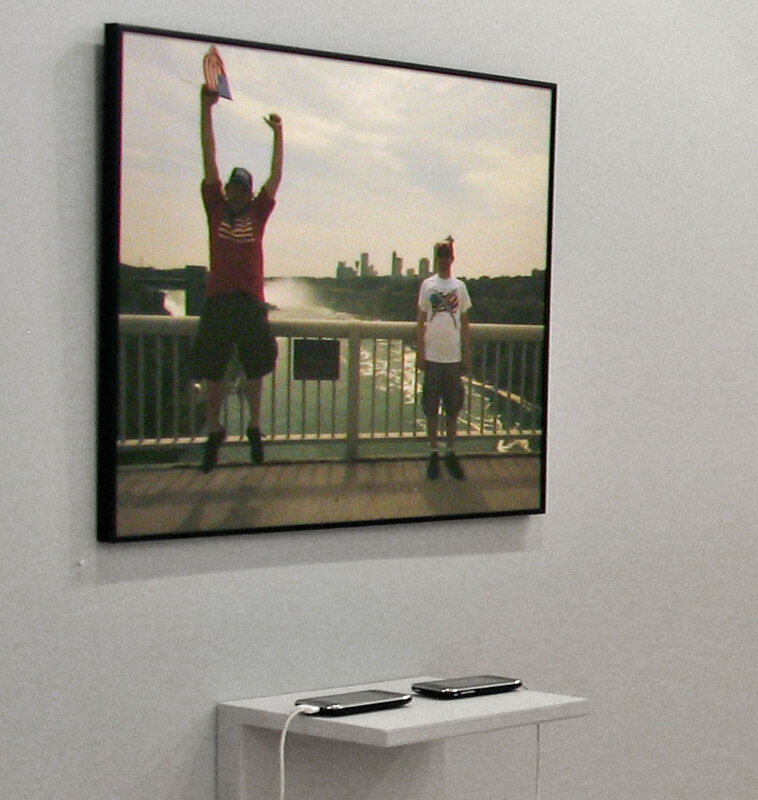 Installed at Gallery Kayafas in Boston, the project was presented as a photograph with two videos. The videos were shown on a pair of iPhones.